New LeBron Trainer styled similarly to last year's "Dunkman" LeBron 8 P.S. When LeBron James isn't going to work in his signature models on the court, you can usually catch him in a pair of Air Max runners off of it. 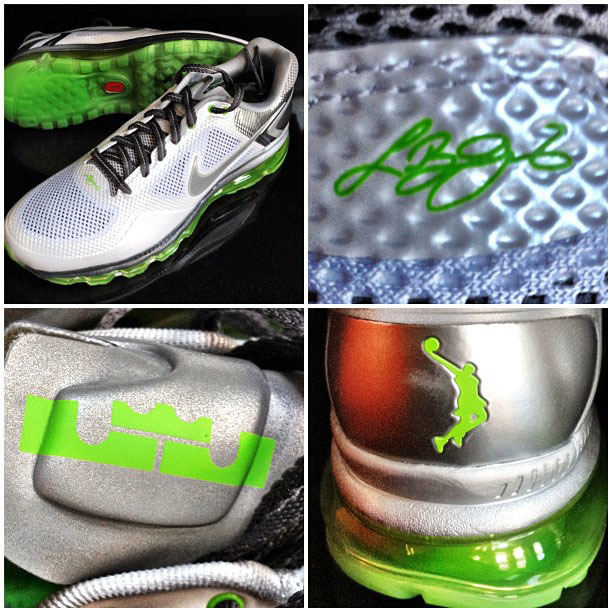 In the past, we've seen several exclusive Air Max make-ups for James, including Dunkman-themed 90s. The popular concept was recently used again on another Air Max, but this particular shoe was pulled from the brand's training range. Styled similarly to last year's "Dunkman" LeBron 8 PS, LeBron's Air Trainer 1.3 Max Breathe features a white and silver Hyperfuse-constructed upper. Open-hole mesh panels provides ventilation on the toebox and sides. Electric Green provides the familiar "Dunkman" color pop on the upper eyelets, various branding points and 360-Max Air bag. Like other LBJ Maxes we've seen in the past, these will most likely remain exclusive. Would you pick up a pair if they dropped?